Welcome back to the second and final day of the Red Hot Blog Hop! Once again if you arrived here from Nana Donna's Card Dreams then you are heading in the right direction! If not then you will need to go to She's A Sassy Lady blog and start the hop. 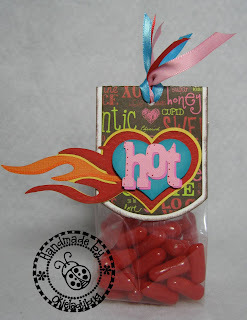 My project for today is a red hot Valentine's Day treat bag. I used Design Studio to make my base for the treat bag topper and used George to do so. For the heart I used George for the heart and Graphically Speaking for the flames and then welded the flames on the yellow and red layers. The "hot" is on the From My Kitchen cartridge. I used ProMarkers to outline on the Cricut cuts just slightly. 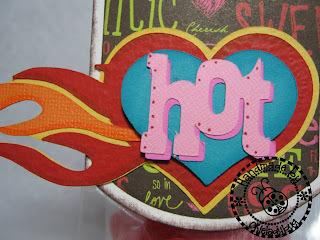 And then did a few doodle dots on the "hot" with a Stampin Up Marker. I punched a hole in the top center and tied ribbon. The bags are just small ones and I folded them over and stapled shut. I used double sided tape to attach the topper to the bag. You can have another chance to win the ProMarkers as I will be drawing from the comments from yesterday and today. To enter the giveaway on my blog just leave a comment on this post and I will use Random.org to choose a winner. Comments will be closed on Monday morning at 8am. A winner will be drawn randomly from one of the blogs in the hop so make sure you comment on each one both days of the hop! To continue on the hop just click the button below and don't forget to leave your comments along the way to be eligible to win the prizes. Nice job. Your bags are great and what a terrific idea. Thanks for all your wonderful work. Now that is cute. Love the flames. Another fabulous project! Your treatbag is so cool--or do I mean hot?!? Anyway, I really like it!! Okie love your Treat bag! It is totally RED HOT! Thanks for joining all of us on this hop we would hop with you anytime! 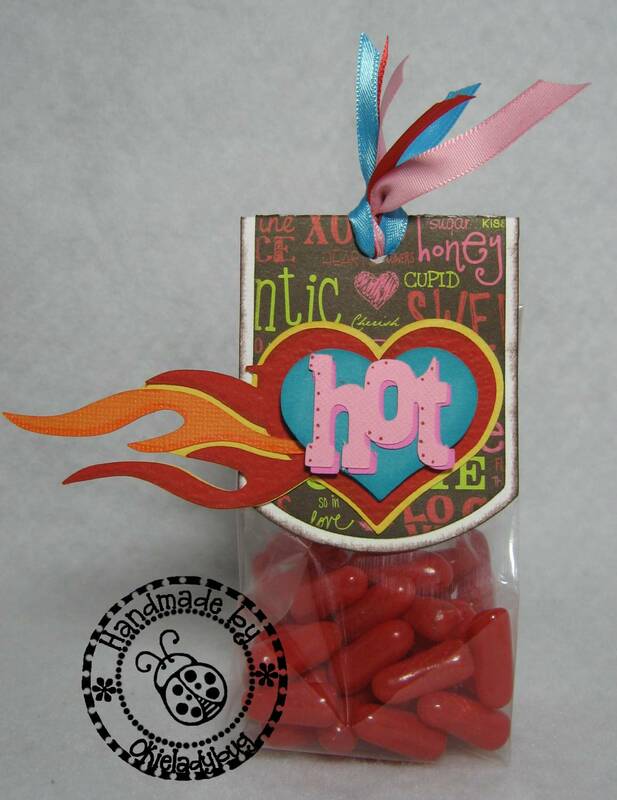 Love the flames and the bag design -- smokin' hot valentine, Okie! This is very cute, Okie! What a great treat bag! I just love the flames! Thanks for sharing! What an adorable bag! My kiddos would love receiving those! Heck, I would too! Thanks for sharing! Absolutely adorable!! I knew I needed graphically speaking! Those are cute....would be a great idea for little boys since that cut isn't too girlie. TFS! This is too cute. I love the background paper. Th heart with the flame is perfect. Great as usual. I love your designs. Thanks for another opportunity to win. What cute treat bags! I love your blog. I'm new to papercrafting and I get so much inspiration from seeing your creations. Thanks!!! I love it, you always do the perfect amount of doodling. Great treat bag! Is the hot tamales in the bag? I am loving this blog hop! Thanks a bunch ladies! Oh my gosh this is too cute. I love those flames!! Another fab idea, love the flames!! Now all you need is to make sure you put cinnamon hearts or "red hot dollar" candy in the bags! Love you treat bag toppers Okie!! That is purfict for the candy inside!! I would love to have a set of promarkers! Thanks for being part of a fun Blog Hop and see you in the Circle!! Adorable, I love red hots ! What a great idea for the treat bags and the theme! Awesome! Oh I love the flames. This use to be my sons favorite candy when he was little. This is a great bag for a boy. It isn't so pink. Another great idea from Okie. How do you do it? Great topper for these treat bags! I love it!! Thnaks for sending one of these home with me yesterday. I'm putting it with my V-Day card I made and giving it to DH tomorrow. Again, you should see these in person! It's cute, cute, cute! Haha! The treats are a perfect choice! The topper is fantastic, I really love how you made the flames with the heart. TFS such great ideas! Oh this is great. My boys would love this. So many things are girly on blogs you rarely find cool boy things. Thanks for sharing! Cute card, I love all of the detail. What fun treat bags! TFS! didn't realize this was a hop but had to tell you loved the flames on the heart---way cool. tfs! This is SO cool! Just love everything about it. Especially the way the flames shoot out the side of the label. Such a cute care, Okie. Love red hots! This is very cute. TFS. I just love your blog. Love the red hot bag. Can't get any hotter! Cute label. Awesome treat bag! This would be perfect for my brother who loves anything hot! Really "hot" treat bags. Very cute. Enjoying the blog hop. TFS! Great treat bags. Your toppers are so cute. Love your treat bags. So cute. Your project is "hot" love it!! love those flames on the heart!! too cute. thank you for a very enjoyable hop, everyone worked so hard and it shows. what a great idea. the flames go perfect w the red hots. tfs. Very cute treat bags! I love blog hops to learn about new blogs! Yum! I love the little flames on the toppers of your treat bags! These treats are just too hot...Great job. Cute treat bag! Love the flames. Great stuff. You have real talent. Thanks for the chance to win. Love the bags. Super cute! Hi Okie!!! I have been following you for a while and I have never commented...and I was wondering...how do you "know" what cart to find an image. I LOVED your matchbook project and today's as well and I am amazed by your creativity and I am always "floored" that you Knew that the flames were in Graphically Speaking etc. As my cart. library grows (largely b/c of you) I find it more and more difficult to remember what images are in what cart. Nice job, as always. great party favor. OK, totally LOVE the flames! Yet another hot project from Okie the card making mastermind! Cute !! I think it makes you a free spirit. We put WAY to much pressure on ourselves!! I have not tried the pro markers so thatnks for the chance to win. Pretty hot. Loved the flames!